Julia Burrows, Neal Mayer, and James Donegan in GREED. Photo by Carol Rosegg. BOTTOM LINE: Ironically, this comedic musical revue about greed leaves plenty to be desired. What do the Catholic Church, Bernie Madoff, a clan of liberal hippies, and a two-year-old have in common? According to the new comedic revue at New World Stages, it’s greed. The new musical GREED: A Musical For Our Times -- low in budget but high in gags -- is a high-energy romp that reminds us that the human race still has quite a way to go. With a four-person cast and a bare-bones stage, the performers inhabit dozens of characters and change through endless costumes in their diverse representations of greed. Written and composed by Michael Roberts, who clearly has some strong feelings toward the greedy among us, we are shown financial advisors, beach bums, mortgage brokers, mothers, and plenty more whose determination for financial and material wealth trumps any foreseeable acts of good will or empathy for others. Julia Burrows, Stephanie D’Abruzzo, James Donegan, and Neal Mayer give it their all with comedic and versatile performances, but the material doesn’t always deliver. Many of Roberts’ characters rely too heavily on overused stereotypes like the welfare queen mother and the gold-digging younger wife, while others, like Bernie Madoff and Charles Ponzi, are extremely on the nose representations of the theme. While there are plenty of clever little ditties to hum along to, the show would be more effective if it could offer a more complex and fuller exploration of its theme rather than an overly simplistic and surface-level mockery of the money-grabbers, criminals, and stereotypes that the title most obviously describes. Though it often strives to be a biting satire, the show is more enjoyable for its physical gags. The opening number featuring Mayer as a two-year-old baby, and a later number that portrays famous steroidal athletes achieve a level of irreverent campiness that puts the show at its best. But even in the comedy department it often struggles, with awkward moments including forced audience participation and a “selfie” taken to encourage audience members to follow the musical on Twitter. This is, in part, due to inconsistent direction by Christopher Scott. On a technical level, there are many elements that fail to impress. Spotlights struggle to follow their targets, and the extremely minimalistic set and low production value doesn’t do the material any favors (for example, a number called “I Like Things” that has cast members walking around grabbing at the air instead of any actual things). 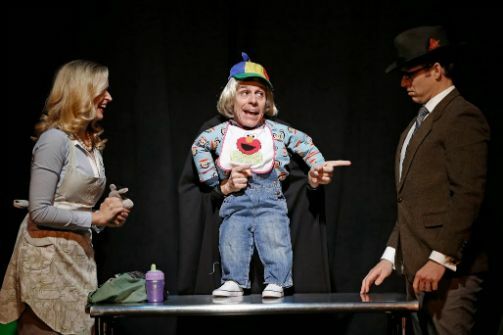 Comparisons can be drawn to other low-budget satires like the everlasting hit Forbidden Broadway, but in a theatre space that shares stages with Broadway transfers and big budget productions, this doesn’t measure up. While the show didn’t quite hit the right notes for me, there were some cackling women behind me and plenty of others who were both clearly engaged and entertained by the evening. If you are craving a cathartic mockery of the greedy and selfish, both famous and ordinary, you’ll likely leave the theatre satisfied.